How you spend your summer vacation matters more than ever. Communications interns Will Hopkins '11, Alex Weintraub '11, and Mariam Zakhary '13 contributed to this story. ­Leland Kusmer ’11 spent his summer conducting field research on the Twi language in Ghana. Jesse Marshall ’11 investigated urban agriculture and land use policy in Philadelphia. Amanda Klause ’12 found herself knee-deep in dirt in Tuscany, digging for Etruscan artifacts. Closer to home, nine Chester Community Fellows from Swarthmore spent 10 weeks working with co­mmunity and public service agencies in Chester, Pa. More than 70 Swarthmore students spent their days in Science Center labs conducting cutting-edge research side by side with faculty. These students were among 233 undergraduates who fanned out across the campus, the country, and the world to take advantage of Swarthmore-sponsored research, community service, social action, and other types of fellowships. Interest in summer opportunities like these is growing. Swarthmore’s Office of Career Services, which conducts annual surveys of graduates, reports a sharp increase in the percentage who participated in at least one research opportunity or internship during their undergraduate years. For the Class of 2009, that number was 49 percent. For the Class of 2010, it was 59 percent. These numbers include both students who take advantage of Swarthmore-funded fellowships and those who engage in comparable summer opportunities independently of the College. Several factors explain why. In today’s economy, the old summer-job standbys—waiting tables, painting houses, lifeguarding—are in short supply. Nor can students necessarily count on finding summer employment that pays the wages they need to support the cost of their education. Even more significantly, students are well aware that summer research experiences and fellowships better position them for admission to graduate schools and careers after graduation. More fundamentally, the proliferation of summer opportunities reflects the way in which knowledge is changing and new knowledge is being developed, with important implications for liberal arts education. “The increase in summer research is being driven in part by global changes in what knowledge is,” says President Rebecca Chopp. “Looking back, I think the 20th century will come to be known for the ‘mastery’ model of knowledge, where you could still study everything there is to know about a subject. Knowledge was divided into disciplines, and every discipline had its own set of rules. “In the 1980s and 1990s, the nature of knowledge began to change,” she continues. “Now that knowledge is at our fingertips on the Web, it’s no longer as important—not even possible, really—to know all there is to know about a subject. At the same time, knowledge is becoming increasingly interdisciplinary and incredibly collaborative. These changes require liberal arts colleges to prepare students for the future in new ways, Chopp says, by teaching them how to conduct research and uncover new knowledge in the process. Summer research offers the perfect opportunity for students to work collaboratively with the faculty in the generation of new knowledge. 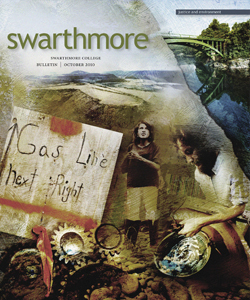 Swarthmore offers summer opportunities across disciplines—the natural sciences and engineering, the social sciences, and humanities—along with community service and social action fellowships offered through the Eugene M. Lang Center for Civic and Social Responsibility, which focuses on promoting civic engagement and social justice. The largest number this past summer was offered in the natural sciences and engineering, largely because funding from outside sources is more readily available. Outside funding included a grant from the Howard Hughes Medical Institute for students preparing for careers in medicine or medical research, along with grants to faculty members and students from institutions including the National Science Foundation and the National Institutes of Health (NIH). Students engaged in STEM disciplines (academic shorthand for science, technology, engineering, and mathematics) tend to immerse themselves in what most people would recognize as true research—an undertaking that produces “an original intellectual or creative contribution to the discipline” as defined by the Council on Undergraduate Research (CUR), a national organization representing more than 900 colleges and universities. 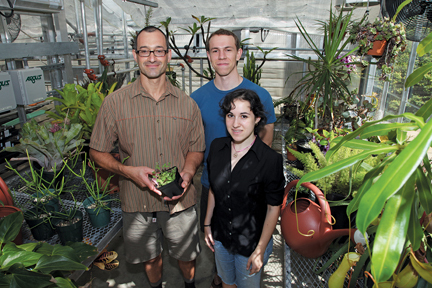 Junior biology majors Julia Cooper and Elan Silverblatt-Buser (center) worked in the lab of Assistant Professor Nick Kaplinsky, mapping genes in a plant they tended in the Martin greenhouse. “There were moments when I thought to myself, ‘Ah ha! I’m the first person in the world to see this!’” says Silverblatt-Buser. Elan Silverblatt-Buser ’12, an honors biology major, had just such an experience while working with Nick Kaplinsky, assistant professor of biology. His research, supported by Kaplinsky’s NIH grant and an undergraduate fellowship from the American Society of Plant Biologists, included mapping an unknown gene in Arabidopsis, a plant related to cabbage and mustard. The same sense of discovery is in play in the humanities and social sciences where, because outside funding is limited, summer opportunities are largely underwritten by the College. A Swarthmore grant allowed Amber Kavka-Warren ’11, an honors major in philosophy and minor in linguistics, to conduct original research into the nature of human rights, an undertaking that will support her midterm paper in her Social and Political Philosophy honors seminar. Like Kavkia-Warren, many Swarthmore students incorporate their summer research into papers and theses. Outside the lab and library, other summer experiences allow students to expand upon knowledge gained in the classroom while helping them to prepare for careers after graduation. An English literature major and theater minor, Nell Bang-Jensen ’11 received a Swarthmore grant to support her project in the literary department of InterAct Theatre Company in Philadelphia. There, she read and evaluated scripts and prepared a “casebook” for an upcoming production to help guide the directors, actors, and designers. “My experience with InterAct allowed me to fully realize the connections between my work in the classroom and the work done in professional theater,” she says. “It required me to think about plays more analytically, as I would with a text in an English course.” At the same time, she feels better prepared for life after Swarthmore. 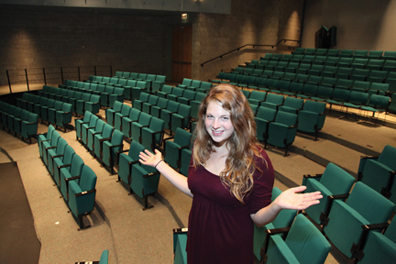 “It solidified my passion for theater and my desire to stay involved in the arts,” she says. In much the same way, fellows supported by the Lang Center build on their academic experience with an eye toward the future. Along with the Chester Community Fellows, another 24 students received Student Summer Action Awards from the Swarthmore Foundation at the Lang Center for work with nonprofit organizations, grassroots advocacy groups, and public service agencies. “Our students are using the interdisciplinary problem-solving skills they acquire in class to address issues of social justice and positive social change,” says Joy Charlton, professor of sociology and executive director of the Lang Center. Summer opportunities are competitive. Although the selection process varies among the Lang Center and the College’s three academic divisions, students typically submit carefully thought-out applications describing the scope and purpose of their summer projects. These in turn are reviewed by faculty, external programs when required, and, in the case of the Lang Center, a committee including faculty, staff, and students. The requirements may be stringent, but the rewards can be great. Students engaged in research often enjoy the kind of close oversight and collaboration with faculty that can only be had at a small college with a low student-faculty ratio. “We are trying to give undergraduates the mentored experience that, at universities, is more often reserved for graduate students,” says Provost Connie Hungerford. Hungerford points out that many faculty members go the extra mile to support summer opportunities for students. Faculty do not receive additional compensation from Swarthmore for mentoring students during the summer, and the time they invest can be considerable—particularly in STEM disciplines, where research may require day-to-day supervision of students’ work in laboratory settings. A considerable body of research, much of it catalogued by CUR, shows that students engaged in summer experiences benefit greatly on a number of fronts: They spend more time studying and engaged in academic discussions, they develop closer relationships with professors, and they are significantly more likely to go on to graduate and professional schools. Although much of this research has focused on STEM disciplines, anecdotal evidence suggests that students in other fields enjoy similar benefits. The same holds true for students who enter the job market after graduation. “There is a well-defined correlation between this type of summer experience and job offers, not just at Swarthmore but all over the country,” says Nancy Burkett, director of Career Services. Burkett points to a study of more than 400 U.S. colleges and universities conducted by the National Association of Colleges and Employers (NACE) in 2010. The study defines summer experiences broadly, including internships offered by employers as well as the grant-funded fellowships offered by institutions such as Swarthmore, but the results remain signficant. NACE found that 42.3 percent of seniors who had internship experiences and applied for jobs received at least one job offer. Conversely, only 30.7 percent of seniors without internship experiences who applied for a job received an offer. The survey also showed that seniors with internship experiences were offered higher salaries than their non-internship counterparts. The cost of providing summer opportunities for students is not inconsiderable. In 2010, Swarthmore spent $709,397 on research and other summer grants. Another $204,450 came from outside sources, including HHMI and NIH, for a total expenditure of $913,847. Typically, each student received a stipend of $4,350 to cover, at minimum, the cost of living expenses and to provide a contribution toward their educational expenses. This year, the stipend grew from $3,750 to $4,350—the first increase in nearly a decade—because the cost of room and board has risen and because the College recently increased the summer earnings contribution it requires of students receiving financial aid. Because Swarthmore-supported stipends had been paid strictly from restricted and endowed funds, however, that increase—and a decline in endowment spending because of the economic downturn—required that the College find additional funds to underwrite summer opportunities. Longer term issues include anticipated demand from students. Creating new summer opportunities will require new funding from institutional donors, alumni, and parents, says President Rebecca Chopp. During the 2011 academic year, the College hopes to raise $750,000 in new, endowed funds to ­­­support additional summer projects. Susan Clarey is director of advancement communications. Read more about these students’ summer opportunities.